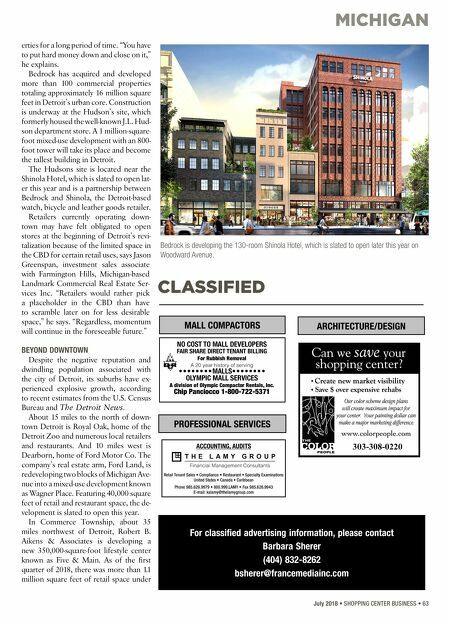 MICHIGAN 62 • SHOPPING CENTER BUSINESS • July 2018 W alk down Woodward Avenue in downtown Detroit and you'll now find trendy retailers like Bonobos, lululemon and Warby Parker. Turn the corner to Capitol Park and you'll find the city's most expensive restaurant, Prime + Proper. The steakhouse occupies property in a part of town that was not long ago plagued with vacancies and run- down buildings. But today marks a new chapter for downtown Detroit and its retail presence, a "renaissance" some say. 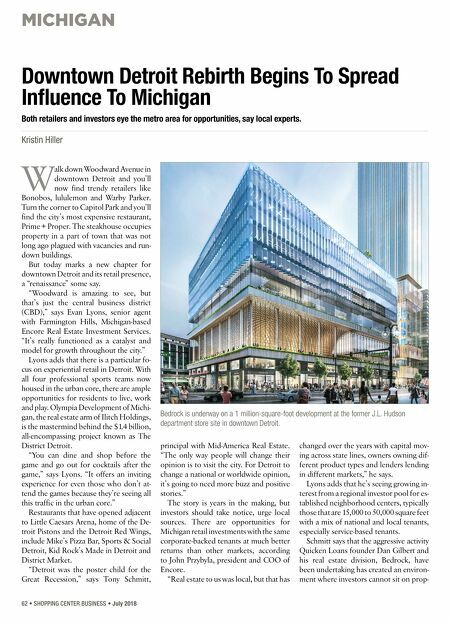 "Woodward is amazing to see, but that's just the central business district (CBD)," says Evan Lyons, senior agent with Farmington Hills, Michigan-based Encore Real Estate Investment Services. "It's really functioned as a catalyst and model for growth throughout the city." Lyons adds that there is a particular fo- cus on experiential retail in Detroit. With all four professional sports teams now housed in the urban core, there are ample opportunities for residents to live, work and play. Olympia Development of Michi- gan, the real estate arm of Ilitch Holdings, is the mastermind behind the $1.4 billion, all-encompassing project known as The District Detroit. "You can dine and shop before the game and go out for cocktails after the game," says Lyons. "It offers an inviting experience for even those who don't at- tend the games because they're seeing all this traffic in the urban core." Restaurants that have opened adjacent to Little Caesars Arena, home of the De- troit Pistons and the Detroit Red Wings, include Mike's Pizza Bar, Sports & Social Detroit, Kid Rock's Made in Detroit and District Market. "Detroit was the poster child for the Great Recession," says Tony Schmitt, principal with Mid-America Real Estate. "The only way people will change their opinion is to visit the city. For Detroit to change a national or worldwide opinion, it's going to need more buzz and positive stories." The story is years in the making, but investors should take notice, urge local sources. There are opportunities for Michigan retail investments with the same corporate-backed tenants at much better returns than other markets, according to John Przybyla, president and COO of Encore. "Real estate to us was local, but that has changed over the years with capital mov- ing across state lines, owners owning dif- ferent product types and lenders lending in different markets," he says. Lyons adds that he's seeing growing in- terest from a regional investor pool for es- tablished neighborhood centers, typically those that are 15,000 to 50,000 square feet with a mix of national and local tenants, especially service-based tenants. Schmitt says that the aggressive activity Quicken Loans founder Dan Gilbert and his real estate division, Bedrock, have been undertaking has created an environ- ment where investors cannot sit on prop- Downtown Detroit Rebirth Begins To Spread Influence To Michigan Both retailers and investors eye the metro area for opportunities, say local experts. Kristin Hiller Bedrock is underway on a 1 million-square-foot development at the former J.L. Hudson department store site in downtown Detroit.